The Detroit Free Press (shocker) discovered that Stonum spent 3 days last month in the clink for "multiple probation violations". 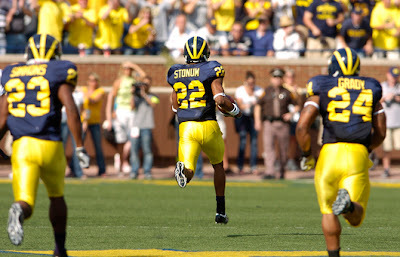 In September 2008, Stonum was busted for operating a motor vehicle while visibly impaired (i.e. drunk). What likely happened was he was caught driving a car when he wasn't supposed to...but that's just my guess. I swear they must have interns at the Freep who just do nothing but scour police records and jail records looking for Michigan football players. Sorry, I'm just a little bitter. While it's not a good thing that Stonum was busted, this story made its to my blog not because of the Darryl and his transgressions as disappointing as they are, but because it just simply illustrates how the Free Press just irks me to death. I'm sorry to any of my readers who subscribe to that paper or knows someone who works there...I simply have no patience for a so-called "news" outlet that targets a university and it's coaches and student athletes with made-up stories and blown-out negative headlines. This story is just another in a long line of examples of why you will never find a link to their site on my blog. You write "While it's not a good thing that Stonum was busted"
No, that he got busted was the good part. It's not a good thing the kid drove drunk. I'm sure DFP would have made a similar report concerning the arrest of a politician, a musician or most other public figures. This is not a story about the Detroit Free Press, this is a story about how a prominent athlete, a public figure, acted irresponsibly and put others' lives at risk by behaving recklessly. While I see your point, and agree that Stonum driving drunk is very bad, that happened almost 2 years ago. I have no problem with anyone who reported that. My point is that this latest issue was simply a violation of his probation. By the way, with all the fury of my last post, I forgot to thank you for all the work you put into this blog. Great stuff!